Lovely Cottage with terrace and panoramic view. Garden, BBQ and Pool. Property 2: Lovely Cottage with terrace and panoramic view. Garden, BBQ and Pool. Lovely cottage with panoramic pool. Just 1 km far from the village Casole. Property 23: Lovely cottage with panoramic pool. Just 1 km far from the village Casole. I stayed here with my spouse, mother-in-law, and 2 young children (3 years and 5 years old) for 5 nights. We had a wonderful time. The house is very spacious, and the property is stunning. We enjoyed the character of the home so much... the spiral staircase, the fireplace (it smoked some into the house, but I've been assured it doesn't typically do this), playing checkers on the game table, the archways and stone walls. 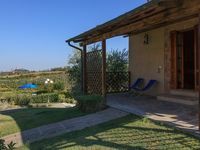 We also loved the property - playing tag with my daughters in the olive grove, watching them swing together on the swing from a giant tree, and enjoying the sunrise over an expansive scene of hills and olive groves. Giada is a great host, very responsive and helpful in every way. The only thing is that renters should consider that there are additional fees for heat/electricity/firewood and cleaning, as mentioned in the homeaway listing. For us, cleaning was 150 euros and the heat/electricity/firewood came out to just under 190 euros (for 5 days in late November... perhaps it would be less during another time of year that is warmer). Still totally worth it, but it's good to have a clearer idea of numbers going into the rental. 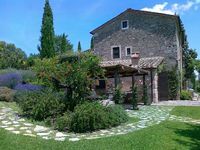 All in all, it was a magical stay, and we are so grateful we found this beautiful villa for our days in Tuscany. We arrived at the San Gimignano cottage after a long drive from Venice. Boy were we happy to see such a serene, calm and beautiful rental. It&rsquo;s neat as a pin with beautiful views of the town of San G from the living room window. It&rsquo;s close to town but quiet and away from the tourists. The surrounding land of vineyards and olive groves is right out of a fairy tale. The whole home looks to be very recently refinished but keeping its charm. The bathroom and kitchen are super. It&rsquo;s got all the cookings implements you need to prepare a nice dinner. The shared washing machine is very convenient. The hosts are very charming and eager to please. The bed is very nice. And for the price, it&rsquo;s a bargain. We had a car, necessary for this rental, and we explored Volterra one day and Lucca the next. There are several restaurants that are very good in San G. We were very happy with our choice.